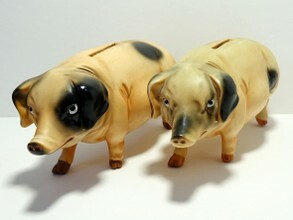 Both piggy banks are from the same mould but decorated differently. It’s special to see another example of the pig piggy bank I have in my collection since 1997. I had some hesitation to ad the recent addition to my collection. But why not: I have more examples in different colours and decorations. The pigs are with 90% certainty made in Germany.